It Is March and once again the silence of winter slumber is broken by the sound of the tractor firing up. The feel, smell, and sight of dirty hands, diesel, and fresh dirt can be addicting to us, just as much if not more than turkey or deer hunting. It gets us excited and brings us satisfaction. There is nothing a hunter and manager would rather do more than climb up on the tractor, wipe the dust off the seat, and break open fresh ground, but is that really your smartest move? While it might feel like you are doing something positive you might want to think again, give it more time, more planning, and as a result, better execution. Don’t make the common mistake of creating a hunting strategy according to your food plots, when you should be planting spring food plots according to your hunting strategy! Implementing the latter of the two will create more opportunity, better hunting, and more success. 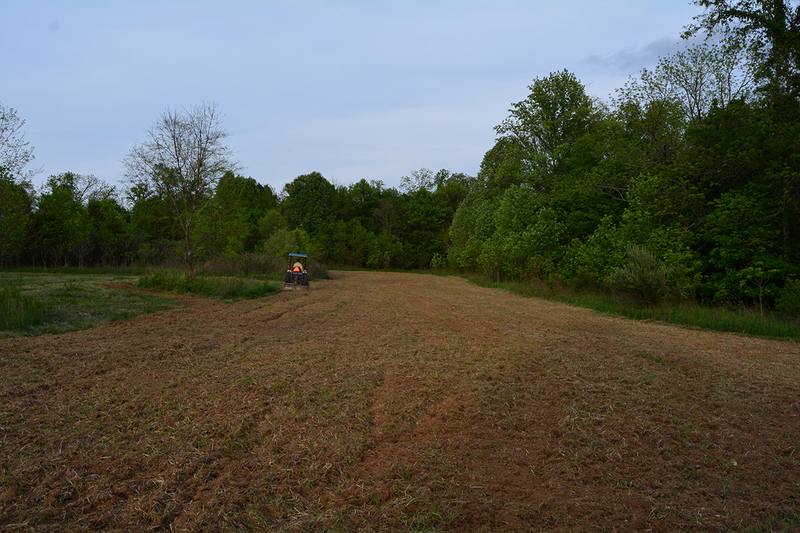 The first question to ask yourself is why are you planting the food plots? For nutritional purposes or for hunting in the situation of the “kill plot”? You can bet on the majority of hunters that plant food plots, are doing so to create hunting opportunities. So which of the following situations would make the most sense? Option 1: Going to a chuck of timber or an old field and clearing it, breaking the ground, and planting beans or clover just to find out there isn’t a single place to put a box blind, tripod, or ground blind that a deer wouldn’t bust your wind or your entry in. 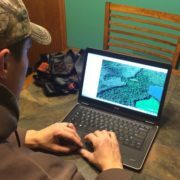 Option 2: Strategically mapping known deer movement, tree stand or blind sites, and previous observations, then taking that information to determine where, what type, and when a food plot would make sense in that area. The choice is obvious, we understand that…and we know that if your planting a food plot you are already putting up stands or blinds in your mind. The problem lies in the fact that this thinking (not even enough to call it planning) happens when you are sitting on the tractor, or waiting for rain after planting. True, successful, well thought out plans for a food plot will only come from enough time being devoted to a map, scouting, past hunting observations, and more often than not, research on the subject. Here is some information that will help you out with your spring food plots, ensuring you are maximizing your efforts, time, and hard earned money. Hopefully you took some time to shed hunt this winter, and took some notes down when you were out and about. Shed season was the perfect time to scout, you were not negatively impacting your deer season next year with the pressure, and deer sign was still fresh from November and December. Marking scrapes, rubs, funnels, highways, and bedding areas down on a map and coordinating that with hunting season observations give you a great idea of the daily movement that takes place on your property. When it comes to installing and planting food plots this spring, human pressure, staging areas and bedding areas are your biggest concern. Where are the deer, more importantly bucks bedding. Once a known bedding area is marked, next figure out when, where, and which type of food plot would make sense in the area. This is by far the most tedious part of effectively planning food plot strategy with your hunting strategy. The best advice in the situation, before diving into researching the when, where, and which type of food plot to plant, is to think about when you hunt, and what food sources are available during that time around the property. Are you a turkey hunter, a land manager, or a just a deer hunter? When you deer hunt do you hunt with a bow in the early season, or are you a gun hunter waiting on November and December? Each situation has its own, where, when, and which type of food plot you need. If you’re the turkey hunter, the ideal food plot set up is creating a food source and strutting zone that you can effectively hunt with a ground blind. In these situation size isn’t as much an issue as what type of food there is. In the situation of turkey hunting in the spring, the best candidate for turkey hunting food plots in the spring is clover and alfalfa. Clover and alfalfa explode in spring, making not only valuable spring forage for deer, but dynamite feeding and strutting sites for turkeys. Late spring and summer are months of nutrition and observation. Does drop fawns, and bucks are just starting to develop some substantial velvet growth. During the lactation and antler growth stages of the year for deer, protein is valuable. Both pastures, hay fields, and food plots with substantial alfalfa and clover and large bean fields provide the protein and attraction deer need and want. These food sources also give you a great opportunity to sit up in an elevated box blind, a ground blind, or tree stand some distance away from the food, to observe and scout the bachelor groups. Planting food plots in spring, in order to hunt over them in September-October will either take place in the form of the two best attractants of the season, beans and clover. Sure their might be some room for opinions, but staging areas in the form of small clover ( white clover) plots, adjacent or on the way to a larger food source like standing beans are dynamite locations for an early season sit. Deer will still be or just coming out of their early season patterns during early bow season, meaning they are unpressured in those small clover “kill plots”, and on the edges of large bean ag fields, or food plots Planting clover by frost seeding or drilling, disking, or tilling, in early spring during decent rain, will work for small food plots. If you want beans for the early season you will need either at least 5 acres, or install a food plot electric fence to avoid deer over-browsing the plot. Opening day of gun season is a holiday (at least it should be). Nothing is better than lifting a buck onto the tailgate during that weekend, so which food plot will give you that, or any weekend after until the close of the season? Beans, corn, and brassicas are the favorited in the November-January time period. Brassicas are planted in the late summer/early fall period before the season opens, so you can delay planning and planting that food plot until later in the year. Planting beans and corn however takes more time and precision. Cut corn fields make for some of the best rut hunting in November in the Midwest, but standing corn and beans in late November-January can’t be beat for attraction. Size is important when it comes to which type of food plot seed you select, depending on the browse resistance of the species, but the design and shape of the plot can really start honing in hunting strategy, and working together with your hunting blind and tree stand placement. This is the most popular standard food plot shape and design, whether you are a firearms hunter or a bow hunter the rectangle is your friend. The length gives you the acreage and the long shot potential when hunting with a rifle or muzzleloader, but the width creates less pressure, stress, and creates more security for deer. It also happens to create a great location for a fixed position tree stand for close encounters for bow hunting. The L shape puts a right angle in the rectangle this does three things better than the rectangle. It creates an elbow, a staging area, and creates more security. Creating essentially two different sections of the plot, while keeping the width relatively small creates the same acreage, but separates the field of view creating less stress for feeding deer, and more movement to see what’s on the other side. The bottom or smaller end of the plot basically serves as a staging area in this scenario. The smaller (potentially different food source) creates a smaller area for deer to stage in before entering the large feeding area. Both of these advantages gives rise to the third advantage, an elbow. The elbow is creates an ideal box blind, tripod, ground blind, or tree stand location, creating a funnel and views of both areas of the food plot. Taking the idea of the Elbow to the next level is the crow’s foot. This obviously serves as an extreme advantage for firearms season. Strips of beans, cut corn, or strips of clover all sprawling out from a central location gives you three shooting lanes, and potentially different buffets for your deer herd. Now knowing your “when” and “what”, you will know exactly where to put it. Obviously a larger bean, corn, or brassica field will go wherever the acreage is available, but the smaller clover/alfalfa plots can be strategically placed. Creating these small opening, “kill plots” n heavy timber, adjacent to thick cover and bedding areas, or as staging areas before a larger food source are successful food plot tactics. The one thing above all else when creating a food plot is knowing how you will hunt it, and if it will work. A food plot that is not hunt able is not ideal, although it does have its place on some properties. A food plot that creates hunting opportunity is a key goal. Planning a food plot effectively means, safe non disturbance entry and exits, multiple tree stand, box blind, tripod, or ground blind locations for different winds, and a food source/hunting opportunity that is completely free of human pressure. As you can see food plots aren’t a walk in the park, but neither is deer or turkey hunting. If it was easy, it wouldn’t be near as enjoyable. Studying, researching, learning, planning, and executing are all a part of the process…the resulting failure or success are both enjoyable, but success feels much better! Take these spring food plot and hunting strategy tips seriously over the next months, and hopefully you will reap the benefits of your hard work.